Here’s the plain and simple truth: you don’t need a website to launch your business. That might sound crazy or unconventional, but the fact of the matter is that while you think a website is what makes your brand or business “official” or “legitimate,” it’s not a priority for making sales. I have seen entrepreneurs waste up to 12 months just trying to create these extravagant websites along with educational materials, sale copy, social media presence, and branding. And this is all before they’ve even began to focus on actually selling. Selling needs to be priority in order for you to actually make money, right? So why spend months of your time on a super involved website and platform if you don’t even know it’s going to sell once it’s setup? Websites are not a prerequisite for brands or businesses. Look, most of us are small business owners with limited budgets. Unless you have millions and millions of dollars at your disposal to launch your business, you’re not going to want to waste your resources on anything that you’re not sure is going to give you a good ROI. So forget the belief that you need a website in order to launch your business. Forget the so-called “checklist” of things you need to do to be a legitimate business. Instead, you need to focus on a process that effectively sells. I’m going to lay this process out for you step by step. It’s the same process I’ve used with clients time and time again to build their business and ramp up their sales. Landing pages have one purpose: to drive action. It’s almost like the distilled version of a website. It’s the action page you would want any visitors on a full-blown website to eventually arrive to. But the main difference between a landing page and a full-blown website is the simplicity of it all. Your goal with the landing page is to convey a strong message in the most beautiful and direct way that you can with no distractions. That’s the thing with a website— there’s more information on it to occupy a visitor’s attention and they are less likely to take action than initially being exposed to a landing page with a simple call to action. The reason I’m emphasizing simplicity is that I see way too many landing pages that are completely cluttered with information. 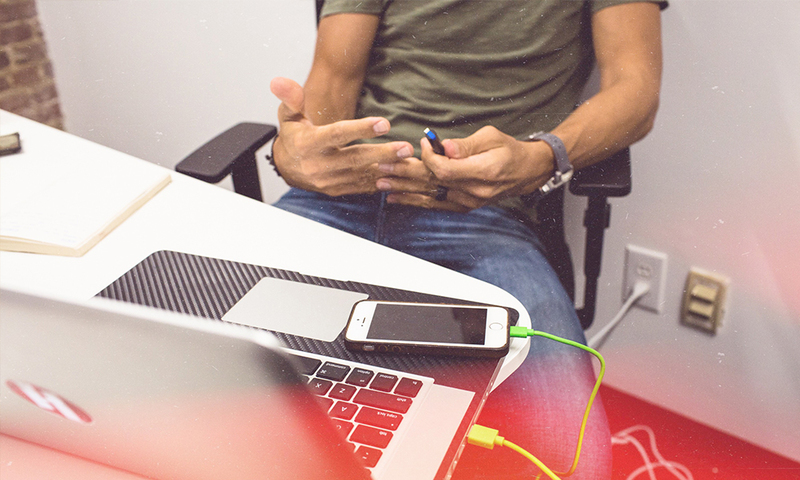 You don’t have to supplement the simplicity of a landing page. Every landing page is a point of arrival. It’s like landing from a flight in a country you’ve never been to. You wouldn’t want to be overwhelmed by new information all at once in a new place, so why do that to the people coming to your landing page? You can give people necessary information on landing page without 1,200 words of copy, 10 pictures, and 15 links. I suggest you check out software like Unbounce which promotes the type of landing pages that do exactly what you need them to do without extra frills. 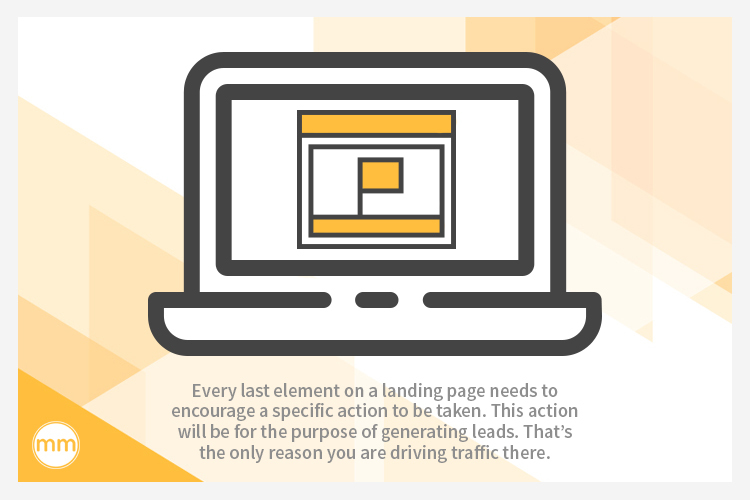 Every last element on a landing page needs to encourage a specific action to be taken. This action will be for the purpose of generating leads. That’s the only reason you are driving traffic there, and the only reason people should be there. So whatever that specific action is, make sure that your landing page is not only optimized for the desired action, but also tracked so you can re-engage people who are visiting the page. But what exactly should this “specific action” be? 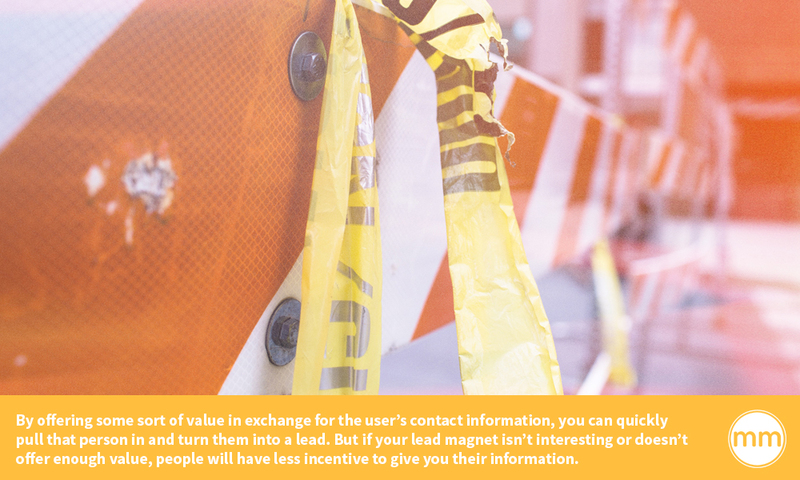 A lead magnet can go by different names— an opt-in, a freebie, trip-wire, etc. But no matter what you call it, it’s the first touch point you have with your users before attempting to nurture them into customers. 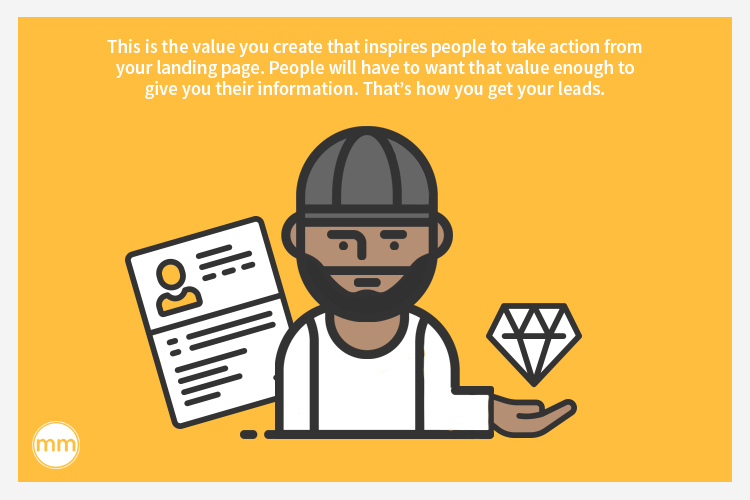 This is the value you create that inspires people to take action from your landing page. People will have to want that value enough to give you their information. That’s how you get your leads. So what kind of value should you be providing in exchange for people’s information? This value should be in the form of content. This content needs to serve two main purposes: to provide a solution to a specific problem and to demonstrate your expertise. These are just a few examples, and there are so many more. You want to choose one format that will work for your business and industry and make it highly valuable. At the end of that content, you can promote your product or service. This is where you begin to sell. Now that you’ve gotten people’s attention, provided them value, and proved your expertise, they are much more willing to buy what you’re selling. Expert Tip: Don’t sell multiple products or services. Focus on selling one thing well. However, most will not buy right away. Nor should they have to. That’s why you’ve collected their email address with your lead magnet. Now you can have multiple touch points with them directly in their inbox. After you’ve provided your lead with some stellar content, you want to stay in contact with them because they are still a lead. They’ve made it this far through your funnel, right? You have to keep engaging them if you want to sell. This is the decision stage of the ACE method. 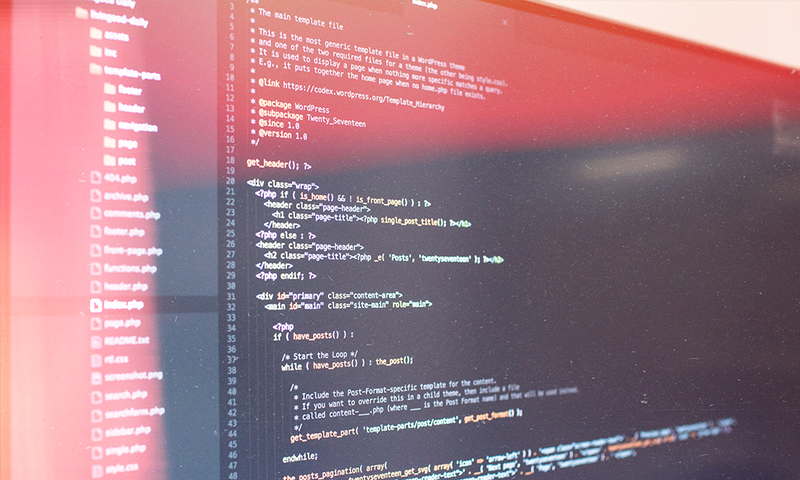 So you need to have an email automation in place as soon as you get your lead’s information. These emails will guide your leads through to the bottom of the sales funnel. When you have a lead and their information, you should use a triggered email message to engage with your audience that respond to their behavior. 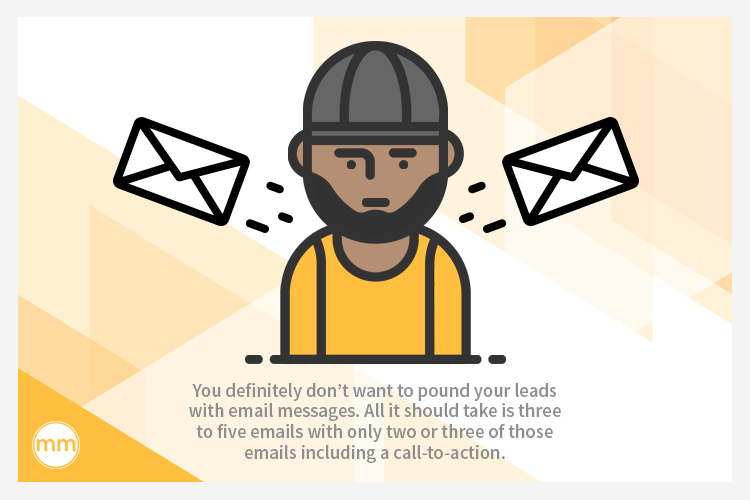 You definitely don’t want to pound your leads with email messages. All it should take is three to five emails with only two or three of those emails including a call-to-action. It’s best practice to segment your email lists to provide the most personalized emails possible. This is what will drive engagement, and ultimately, get you the most sales. 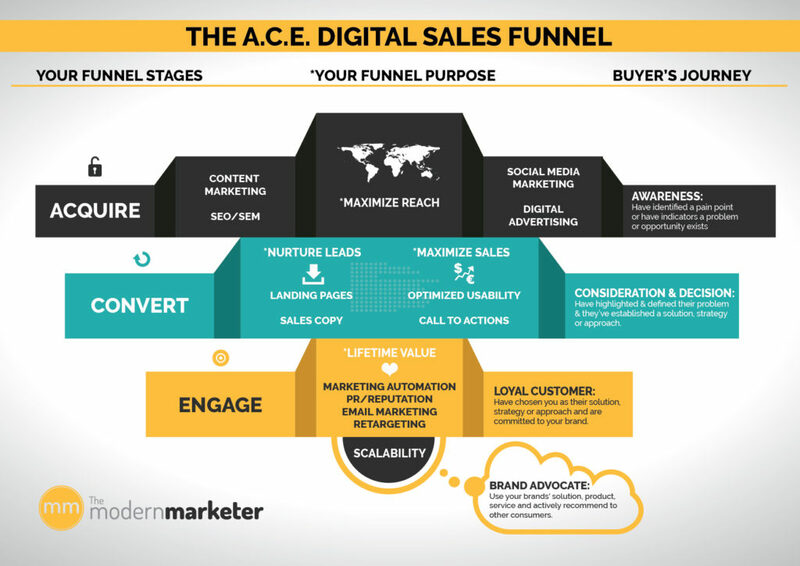 If you’re going to spend advertising dollars on anything, it needs to be on this sales funnel. You want to get people onto your landing page so you can guide them through the rest of the process. 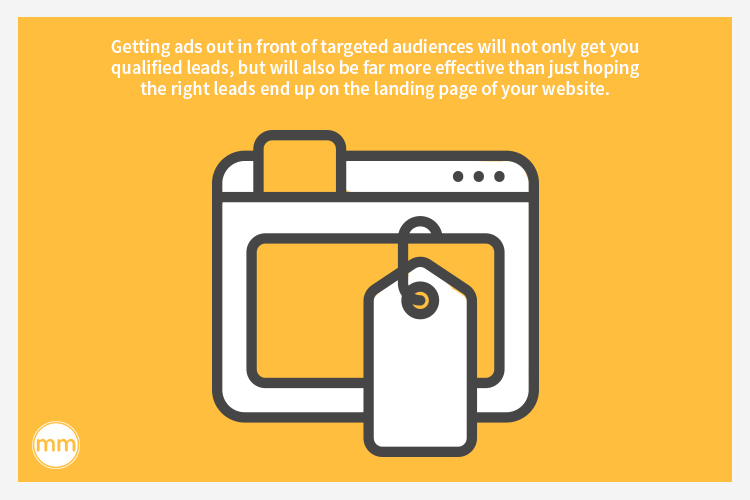 Getting ads out in front of targeted audiences will not only get you qualified leads, but will also be far more effective than just hoping the right leads end up on the landing page of your website. Facebook ads are the way to go. These ads are so highly targeted and inexpensive that it’s almost stupid not to use them. The more targeted these ads are, the more qualified the leads you will get. You can also advertise through a PR campaign or cross-promotion. Consider the influencers of your industry. They can also get your landing page out in front of the right people. No matter avenue you take, make sure you seek qualified leads to get to your landing page. If you run traffic to this funnel for 30 to 90 business days, I promise you will make 10 times the amount of money as if you’re trying to get your ducks in a row for months and months. There’s no need to burn through all your time and money to creating websites, taking the perfect pictures, waiting on things to be in place, or writing amazing content. While those are all important things, you need to be first and foremost prioritize your basic business competencies. The best marketers in the world are salesman. If you’re going to launch something new, you need to streamline the process to prioritize making sales. So don’t spend so much time trying to perfect your funnel, your brand, and your presentation. Just get a landing page and some valuable content up, get some data, get some traffic, and test it out. Then at least you have a legit business that’s killing it in sales, and then you can worry about spending money on your website, culture, team building, and more advertising. Get your marketing priorities straight. I’m a realtor in California. 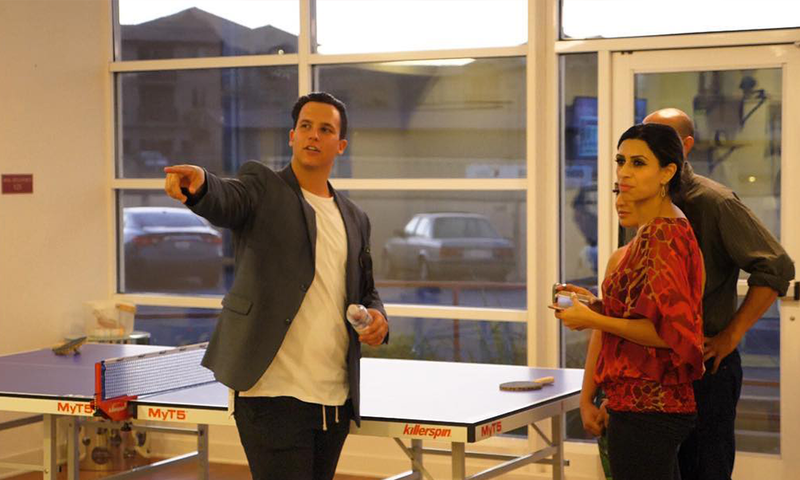 Real estate can be a notoriously difficult niche when it comes to digital marketing. How do you create an epic lead magnet? 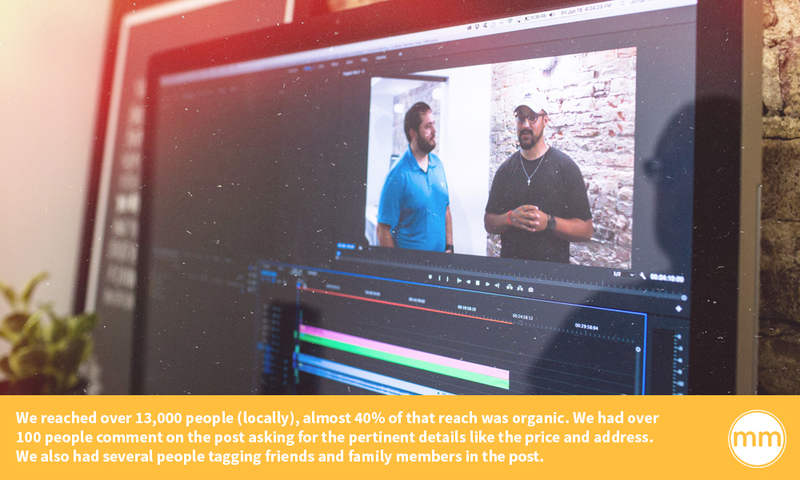 How do you make valuable content for a local audience? How do you attract the right kind of client? As a business owner, I am always doing my best to merge the gaps between what we’re “supposed” to be doing in marketing and how that relates to real life. I’ve always struggled with the idea of lead capture advertising: creating funnels and calls to actions and crunching numbers. It reminds me of a 2017 used car salesman approach to generating a lead. 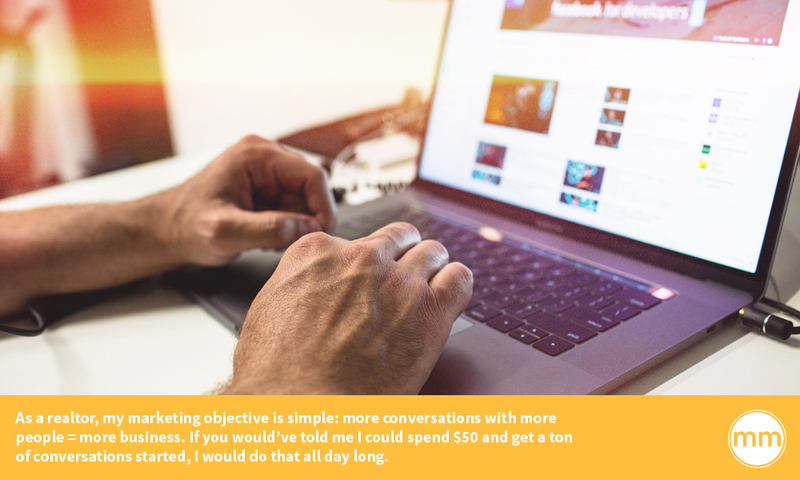 We talk too often about content marketing, bringing value, generating engagement, and yet when we run an advertisements, we don’t do any of that. Instead we see how many people we can throw through a landing page, we hope to capture accurate info so we can put them in a funnel, and keep retargeting them until they buy. I get it, it works…but, is that how marketing should look in 2018? Maybe. But I’m a modern marketer, and I wanted to do more. The concept was simple: run real advertising to a targeted audience. Rather than try to capture a lead by baiting them onto our landing page and requesting them to fill out a form (for the details they originally came to the landing page for) we would offer up all of the information that they would need/want. Furthermore, we’d simply encourage engagement directly on our post. Less friction in capturing a lead would result in a higher volume of leads. And not forcing the lead to enter information (that possibly wasn’t accurate) just to get the thing they wanted would result in a higher conversion rate. 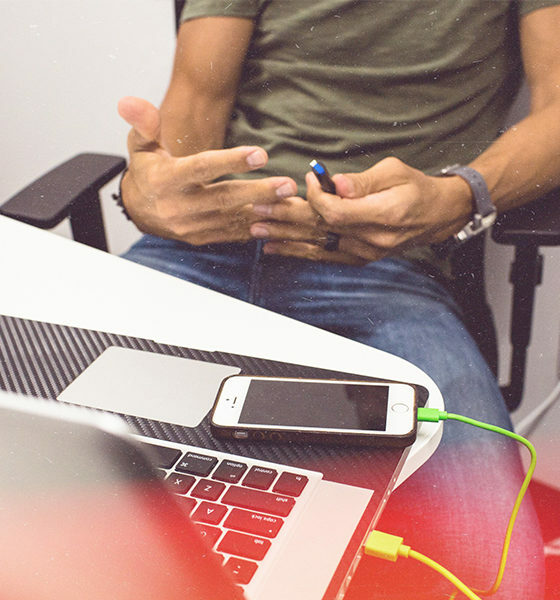 Recently, I’ve been testing out several different strategies on how to use the social/digital foundation that we have and to see if that translates into new business, engagement, and sales. My latest split testing was simple. I would take my product (a home for sale), market it to people who were ready to purchase a home. Rather than direct them to a landing page where they were forced to enter their personal information in return for something, all they had to do was simply comment on the post. The post was structured with long copy, fully explaining the property for sale. It had all of the information a prospective buyer would be looking for: how many bedrooms, baths, square footage, when it was going to be available to see, we even I attached a multitude of photos of in the advertisement. The only thing it didn’t have were two very important pieces of information: the price and the address. To get a hold of the price and address, all you had to do was comment on the post….. something simple like “price?”. As a realtor, my marketing objective is simple: more conversations with more people = more business. If you would’ve told me I could spend $50 and get a ton of conversations started, I would do that all day long. So, we spent $50 on this post simply just to see how it would work for us. The results were incredible. We reached over 13,000 people (locally), almost 40% of that reach was organic. We had over 100 people comment on the post asking for the pertinent details like the price and address. We also had several people tagging friends and family members in the post. We would then privately reply to every single comment, not a canned reply, but an individual reply addressing them by name, answering the questions they answered and finishing with “when would you like to schedule a time to see this property?”. Of the 108 people that commented on this post, 71 of them responded back to our personal message! Never before have I run a real estate advertisement and gotten that type of response. To date, we’ve converted 4 deals out of those 71 conversations which will equate to approximately $60,000 in earned commissions when closed. Incredibly enough, we’ve been able to add an additional 27 people to our database that were still interested in buying or selling their home. If even a small portion of those convert after being pushed through our follow-up systems, we could earn well over 100K…. From $50 Facebook ad. I am far from an “expert” when it comes to funnels, landing pages, lead capture, etc., but I have run my fair share of advertising and have been relatively unimpressed with the quality of leads being generated from these types of ads…at least in my vertical (real estate). Aside from the lack of volume, the quality of lead tends to be very poor as well. I’ve had my fair share of “Johnny Appleseed at 123 Main St.” leads come in, and that’s why I wanted to try this approach. An ad strictly to generate engagement. An ad that was solely about value and human interaction. I have been pleasantly surprised with the results! By taking the engagement on our post directly into messenger and maintaining the conversation there, there is essentially ZERO friction for the potential client. To have over 100 people comment on an ad with only $50 in ad spend was amazing. What’s even more amazing is the 71 people who engaged in a conversation with us. This successful ad wasn’t created with fancy, involved copy. It didn’t lead to a landing page. I didn’t have to come up with some catchy lead magnet. The reason this as was such a winner is because I made it about people and their needs. And the people responded! That’s what modern marketing is all about. It’s just the reality if you want to scale a business profitably—let alone have a chance at running profitable Facebook campaigns. If you’re a small business owner, startup owner, marketer or any type of entrepreneur in 2018 who is NOT spending money on Facebook every day, you’re losing. And you are losing quickly. …and so many more examples. The disclaimer is not every campaign is profitable and successful from day one. I will say, however, that as long as you can hone in on your acquisition costs and create evergreen ads that continually feed your funnel, you will win. If you’re one of the tens of thousands of people who tell us “we’ve tried Facebook before and didn’t get results” or “we haven’t really explored the possibilities” or even “we run Facebook ads and they do ‘okay’ but we feel like we are missing something” then this article will solidify how to run profitable campaigns in a 2018 environment. It sounds complicated until you hear it said like that. In order to figure out what your acquisition cost is in an ONLINE environment, you need to understand the following equation. If you’ve read our content before, you know we like to use real examples to show you exactly how simple these “high and lofty” marketing concepts can be. If you look in the bottom right hand corner, you can see we are averaging $0.09 per click to our website. Side-note: Just to clarify, Facebook is still technically a PPC platform (pay per click) just like Google Adwords. Now, Facebook tends to focus in on different ad types and metrics instead of throwing your CPC in your face—however, it’s still readily available and you should constantly monitor or know where your CPC is for any given campaign. But you can’t just assume that Facebook is right. There is always a little margin for error in any given platform’s reporting. 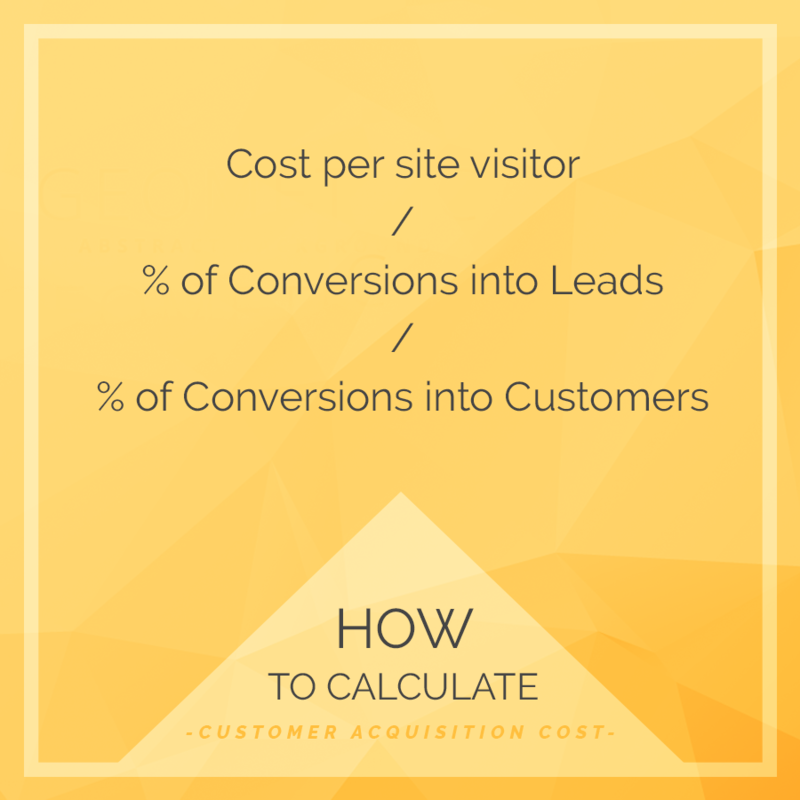 So let’s run that part of the equation to get our REAL cost per generated lead. 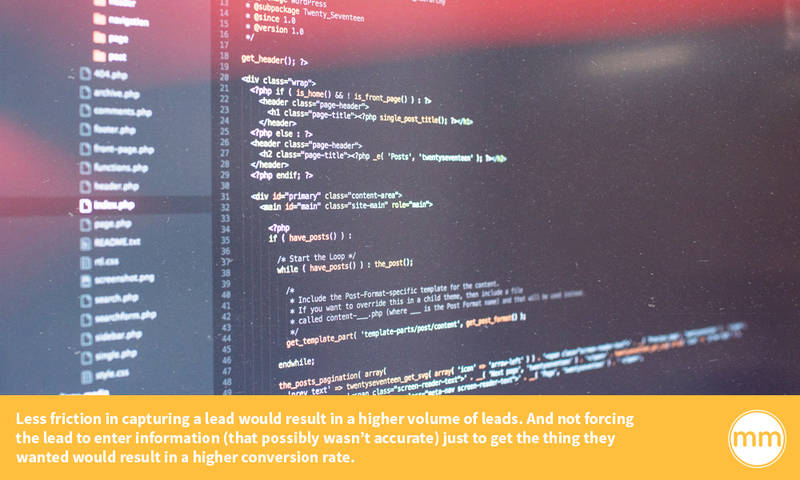 This client was converting these generated leads at 1.13% into sales. So, let’s use that figure to run the next part of our equation. The membership that we are selling here is $25/mo and so far most of the members have been in the membership since it launched several months ago. Wouldn’t you agree that spending $11.81 for every member paying $25/mo is worth it. Especially considering that those members lifetime value is projected at 6 months per member, or approximately $150/member. Anyone would pay $11.81 to make $150. It’s a no brainer. Wouldn’t you? When you are calculating your businesses acquisitions on ANY channel, you have to at least consider these variable costs. And once you know that number, you simple divide the total cost of your variable expenses by the number of customers generated in that same period of time. So, in this case, let’s run the variable costs part of the equation over a 30 day period, or a month. Click funnels is $297/mo, hosting for the site is $9/mo, 5hrs a week from an employee is set at $12/hr ($240/mo) and Infusionsoft is approximately $599/mo—totaling the costs at $1,145 per month. Divide that by 185 customers for the month window. The great part is that we recover the costs on the first transaction, which isn’t always possible. That wasn’t too hard was it? After you do it a few times, you start to get really fast at understanding what it takes to acquire customers. This type of response is very typical. And whether it’s a client telling us or it’s you saying it in your head, we have to collectively come to an agreement that “driving traffic” is rarely our true objective. If driving traffic is your goal in advertising, find a deeper objective. Driving traffic isn’t anything but a building block for a bigger vision in an ad campaign. What actions do you truly want a user to take? What type of nurturing touch points are you going to have with this “traffic” or are you just relying on law of averages to play out and convert 1-3% of them into sales? Typically, it’s 100% up to me what we do with a campaign. This is an approach I like to take when a client doesn’t readily have an email list or database that we can use for targeting and creating audiences. The client, having more experience in their industry than I, prompted me to simply run ads to their buyer persona with as large of a reach as possible. They wanted the reach to be millions. 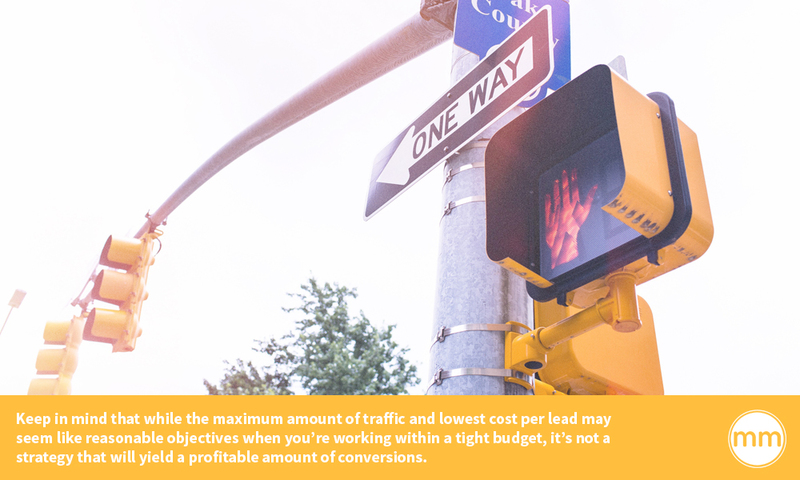 …because in their head “the most traffic and the lowest cost per lead” were the main objectives. Reluctantly, I followed along and sure enough, clicks were cheap, leads were cheap, conversion rates from traffic into leads were decent, but guess what? Out of hundreds of people who were generated as a lead, literally less than 5 of them took further action. We generated maybe 5-6 sales qualified leads, let alone sales. Don’t learn your lesson the hard way. Within 7 days of running a campaign for a clients’ conference where we were retargeting nurtured email subscribers, we generated $125-300 ticket sales for every $15 we spent. We actively created audiences, nurtured them and then guided them down the buyer journey before retargeting them with a decision ad. Don’t wait for your audiences, create them. Maybe you don’t have a large email list, maybe you don’t understand your buyer persona, maybe you don’t have a ton of people who’ve downloaded your app or visited your website. You can’t, however, operate a business in a 2018-2020 environment and not ACTIVELY create audiences for your business. Instead of relying on our buyer persona 100%, we wanted to create new audiences based on user behavior. So, this is how we came up with this Facebook lookalike audience of 1.7 million people. We didn’t want the audience to derive from all paid traffic or all organic traffic, so we used both to create a source (email list) in which we could create this lookalike audience. 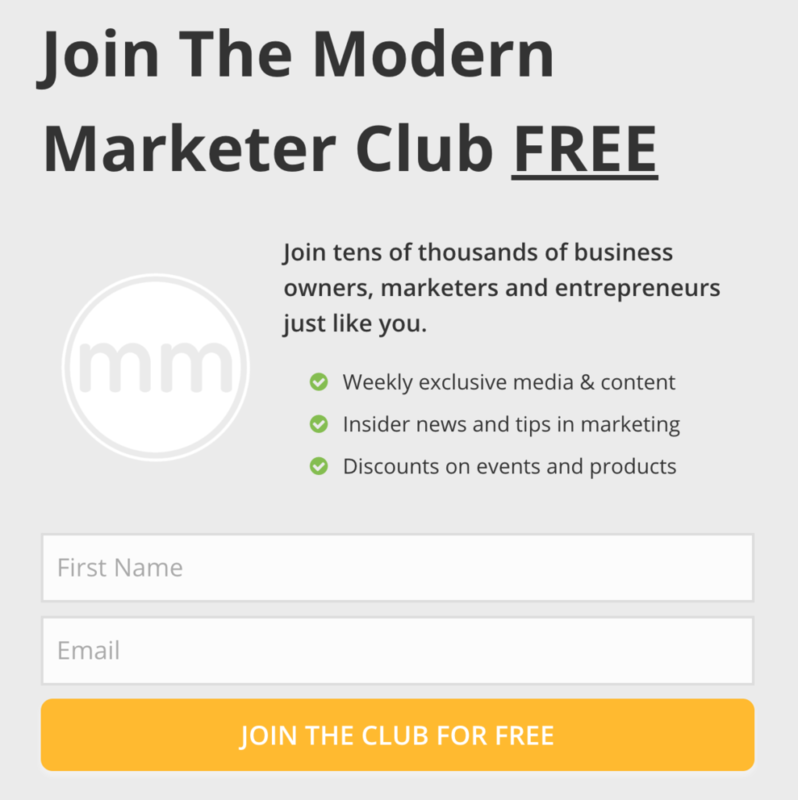 We took less than a week to drive people to The Modern Marketer website via social media (mainly Instagram) and we simultaneously ran a carousel ad on Facebook to our latest and greatest articles. We knew some attributes of our buyer persona and plugged it into Facebook. After a few days we drove about 1,600 people to our website between the two traffic sources. I had set up a simple 2 tiered optin on the website with thrive leads. From there, about 15% of the traffic (from both organic and paid sources) turned into leads from the website. But the important part is that I started with targeted audiences (organic/nurtured users who already love us on social media, and a buyer persona target on Facebook.) From that targeted audience 15% of them BEHAVED their way into our funnel. I took that 15% and went back to Facebook to create a lookalike audience that I am currently using to run a series of ads for a new campaign as you saw in the beginning of this section. The conclusion is that I actively created a highly targeted audience simply by being proactive instead of waiting around for audiences to come to me. One of the number one things that you can do to make sure that you are running profitable Facebook advertising in 2018 is to make your money back on ad spend before you get a user to your core product. 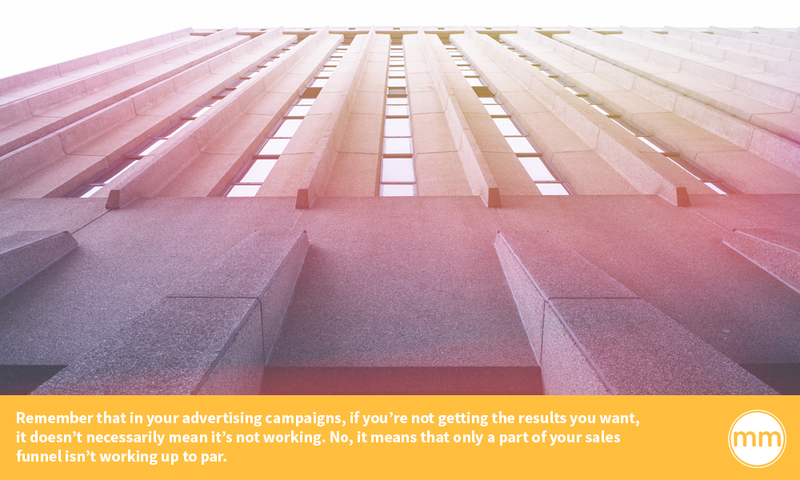 If you can break even on ad spend before you’ve started selling your core product, you’re almost guaranteed to win. Why? Because every sale from that point forward is in the green column (a.k.a. profit). I have a fitness client who runs ads to an ebook and video series to collect leads. After the lead enters their information, a page pops up (before the ebook and free videos) that offers them a limited time discount on an hour session at their gym. I have a real estate client who has an entire set of videos for free to access when you enter your information. When the user consumes the value, they are followed up with a 5-8 part email series upsetting a paid system at a tripwire cost. For him, that’s under $100. We have example after example of how this works. But whatever way you set it up, you need to find a way to recoup most of or all of your costs spent on ads before you even get to the part where you are selling that core offer or product. There is A LOT covered in this article to help you run profitable Facebook campaigns in 2018. The approach, however, is simple—the only variable is your execution. 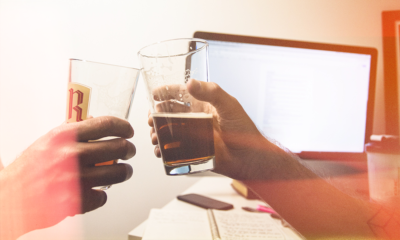 So, bookmark this article and revisit when you’re prepping a new ad campaign. Here’s a recap. Recover your ad spend before the core product is offered. Let us know if this article was helpful for you! If you have any further questions, comment below.